Dedicated to the men and women who flew and maintained these aircraft. Responding to the call to arms, they embraced the difficult challenges and held high the proud heritage of the United States Air Force. This monument stands guard at Pope's entrance in tribute to our airmen, serving as the bridge that spans our present and past. 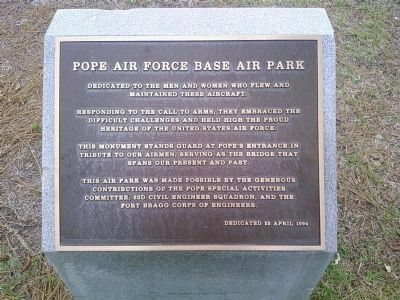 This air park was made possible by the generous contributions of the Pope Special Activities Committee, 23d Civil Engineer Squadron, and the Fort Bragg Corps of Engineers. Erected 1994 by Pope Air Force Base. Location. 35° 9.986′ N, 79° 0.198′ W. Marker is in Fort Bragg, North Carolina, in Cumberland County. Marker can be reached from Reilly Street south of Bomard Street, on the left when traveling south. Touch for map. Marker is in this post office area: Pope Army Airfield NC 28308, United States of America. Touch for directions. 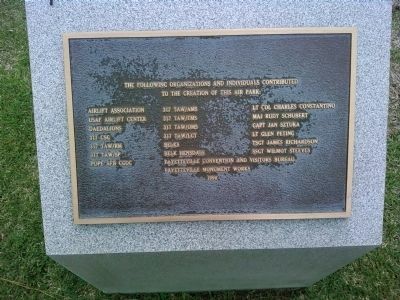 Located next to the main marker, this plaque lists the various organizations and individuals who contributed to the creation of the air park. (within shouting distance of this marker); C-119 "Packet" (within shouting distance of this marker); Pope Airmen Memorial (about 300 feet away, measured in a direct line); Lt. Harley H. Pope (about 300 feet away); Enlisted Personnel Memorial (about 300 feet away); DC-3/C-47 "Skytrain" (about 400 feet away). Touch for a list and map of all markers in Fort Bragg. More. Search the internet for Pope Air Force Base Air Park. Credits. This page was last revised on June 16, 2016. This page originally submitted on July 1, 2011, by Lee Hattabaugh of Capshaw, Alabama. This page has been viewed 604 times since then and 4 times this year. Photos: 1, 2. submitted on July 1, 2011, by Lee Hattabaugh of Capshaw, Alabama. • Bill Pfingsten was the editor who published this page.